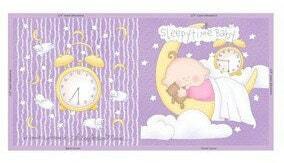 A beautifully designed cotton cloth book panel describing sleepy time for baby. 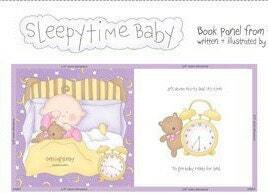 This wonderful cloth book panel from the Sweet Pea Collection from Studio E is a perfect baby shower gift. This sweet little book is 10 pages in length, not including front and back cover. Such soft and sweet shades of lavender, pink, yellow, white, yellow and green. In a few short hours you can create a sweet baby gift. Don't forget your batting, you can purchase it right here! All fabric from The Quilted Nursery Fabric Store is cut directly from the bolt in continuous yardage. We now offer fractional yardage cuts for your quilting, sewing and crafting convenience. Shipping within 24 hours except for Sunday and holidays. All shipping overages are refunded upon shipment of fabric.